Things Your Grandmother Knew: EBay Goes Frugal? Take advantage of articles and tips designed to help you save money! ...The offers on eBay eXtras will be updated weekly, and the Word to the Wallet Wise section will help you get more bang for your buck by offering a new tip every day. The "print coupons" rather annoyed me; I don't know about you and your local grocery stores, but mine won't accept coupons not printed by the company itself. (Hence my loathing of My Coke Rewards -- punishments.) But free samples will almost always catch my eye -- especially if A) they are all in one place and 2) legit enough to be partnering with online giant eBay. So I headed on over to eBay eXtras to check it out. First problem: If you use an adblocker, you'll need to switch it off to read anything at eBay eXtras. I'll admit, I use an adblocker on all new sites. I turn it off at all my regular sites, favorite blogs, etc. because I want to support them if only counting as a view of the ad, therefore helping support them in their advertising revenue hunt even if I don't click and buy anything. It seems the friendly thing to do. I even allow ads to be served in my Blogger dashboard, Gmail, etc. because I love the free services -- but at eBay? They make enough money off me with my seller fees, occasional purchases, etc., so I keep AdBlock Plus on at eBay. Why is the content at eBay eXtras blocked by ad blocking software? Because all of it, from coupons to articles, is provided by a third party; namely Triad Digital Media, LLC. Put a pin in this; we'll be returning to it later. OK, so now I've settled the adblocker matter and now could see and read the content. I skipped the coupon offers and went straight for the free sample offers. Supposedly I will now receive "exclusive insider offers and news" from these companies -- but if I really had wanted that, I would have already visited their corporate site and signed up. So I'm not thrilled to hand over access to my personal contact without receiving a free sample or anything but a corporate promise or tease in return. Maybe you'll have better luck with the samples you request. Third problem: Remember when I said we'd return to the matter of Triad Digital Media, LLC.? Well, here we are. 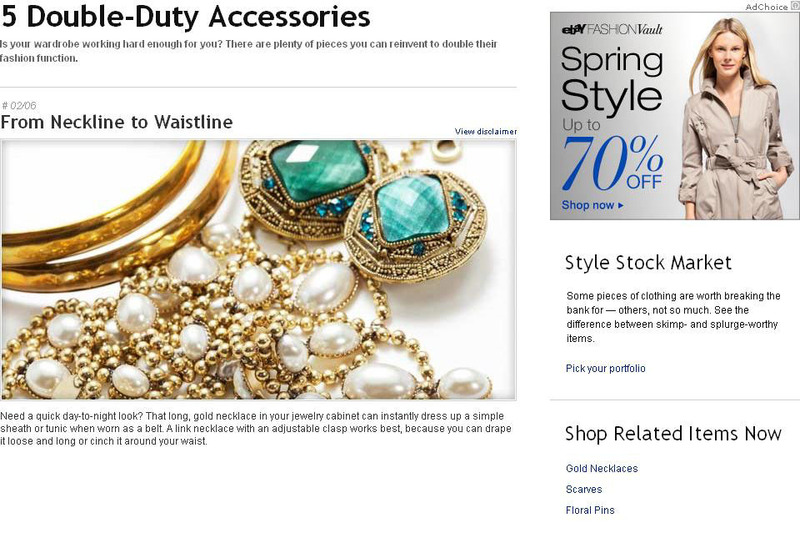 Triad Digital Media, LLC, doing business as Triad Retail Media, provides all the content for eBay eXtras -- including the promised weekly articles and tips in the Word to the Wallet Wise section. © 2011 Triad Digital Media, LLC d/b/a Triad Retail Media All rights reserved. All articles are written and edited by professionals and reviewed for accuracy by appropriate experts. Neither Triad Digital Media, LLC d/b/a Triad Retail Media nor its publisher make any representations as to the accuracy or efficacy of the information provided. Special written permission is required to reproduce in any manner, in whole or in part. Now, I'm not adverse to advertising or smart marketing (I can't be when I'm also Big Mouth Promotions and half of the U.P. to the D.L. team), and nobody knows better than I, the obsessive magazine collector, the long complicated relationship between published content and advertising revenues -- but what really exists here is not the Frugal Promise Land but cheap trick soundbite infomercials designed to make you buy things (mostly unneccessary fashions, at eBay, of course). Overall, I am disappointed with eBay eXtras. ...I might try for a free sample again, because I am a frugal girl; but I certainly won't be looking for tips there. Your mileage may vary, and I'd love to hear your thoughts. I am so tired of Ebay trying to drive business off of their site; away from the seller's who are paying their bills. I wish they'd focus their energy on what they do best, not markets that are already watered down.